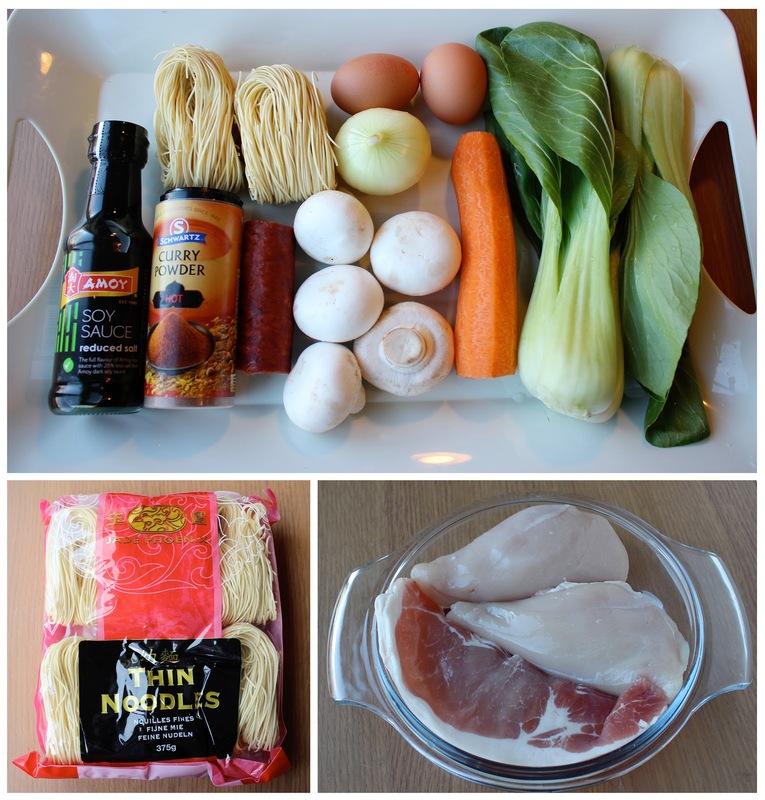 I love Singapore noodle and for the Irish I changed recipe using more of Western ingredients. The original recipe uses dried shrimps, that’s not very popular to find them here so I use chorizo and it works brilliantly. The taste of dish doesn’t change much with that light curry flavour which is the key thing. 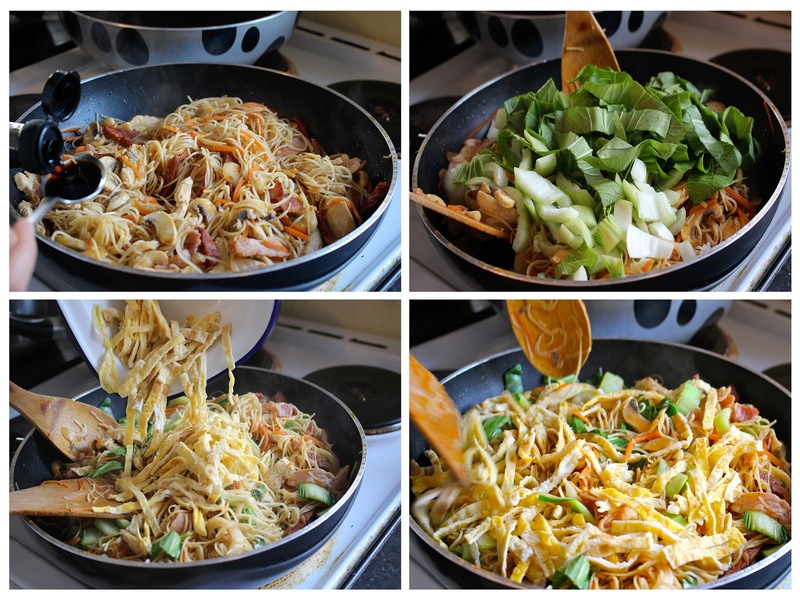 You can use both egg noodle or gluten free rice noodle. 2 bak chois( or other name is bokchoi). If you cannot find bak choi then spinach will work perfectly. Soy sauce and curry powder. For noodle I use this thin noodle from my local supermarket. You could use any kind of noodle that easy to find. The difference is the boiling time. Thicker noodle will need to be soaked in hot water slightly longer than the thin one. This boiling step is very import to get the dish right. In a pot bring the water to boil. Use a fork to separate the noodle and straight away remove the pot from the cooker to stop it comes to boil again. 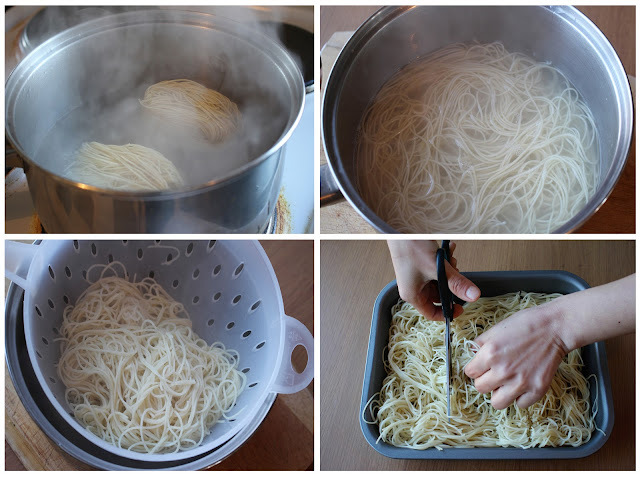 Leave the noodle in the pot to soak for further 3 minutes. Please note not to rinse it because that will make the noodle mushy. While the noodle is still slightly warm spread them on a tray to let them cool.Use a scissor to cut the noodle short before adding to the pan. Sprinkle 1 table spoon of curry powder on top and mix well. 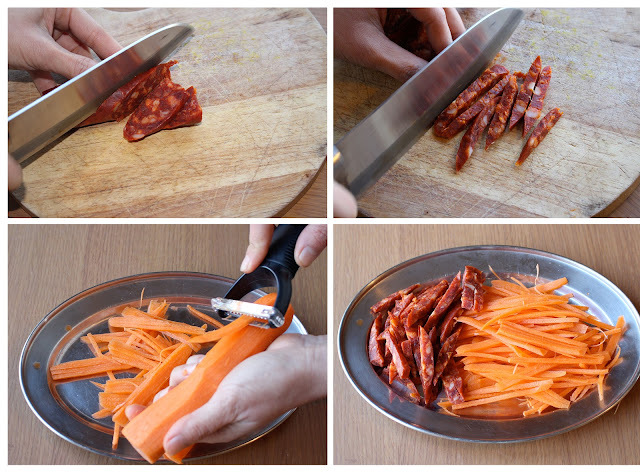 Make a diagonal cut with the Chorizo, then cut into matchstick. Use a shredder and shred the carrot. Finely chop the onion, mushrooms and bak choi as in the picture. 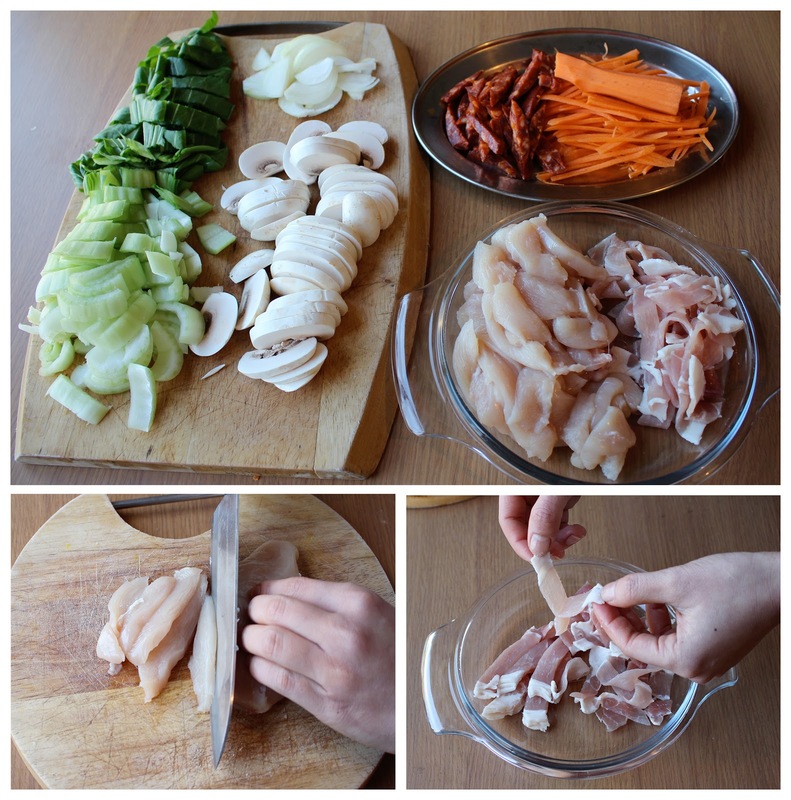 Thinly cut the chicken breasts. 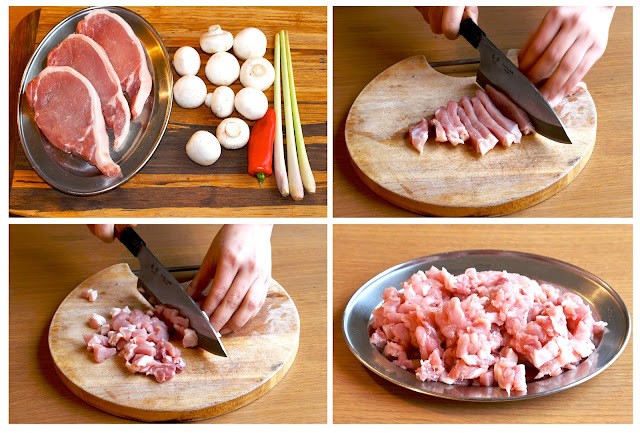 Use a scissor to cut the bacon into small pieces. Use your hand to separate them from sticking to each other. 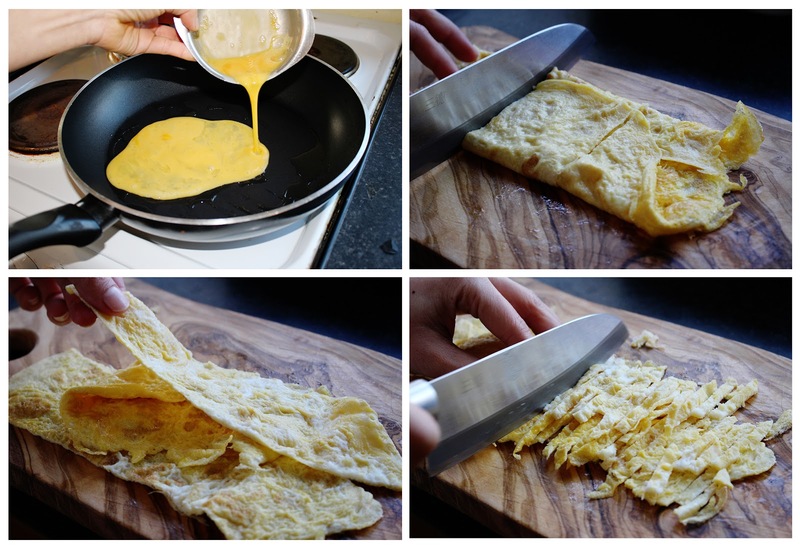 Beat 2 eggs in a bowl and fry them on a hot frying pan. Make sure they flat out like in the picture. 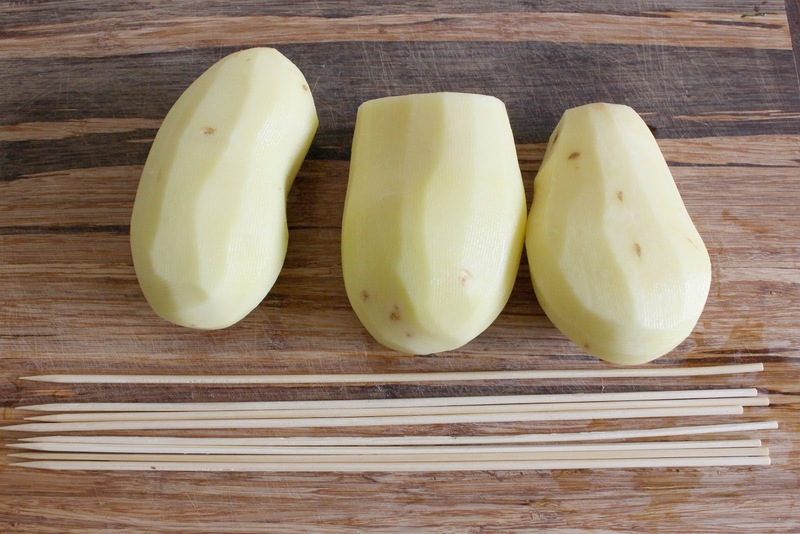 Turn the other side to cook before removing them from the pan. Thinly cut the fried eggs into strings. 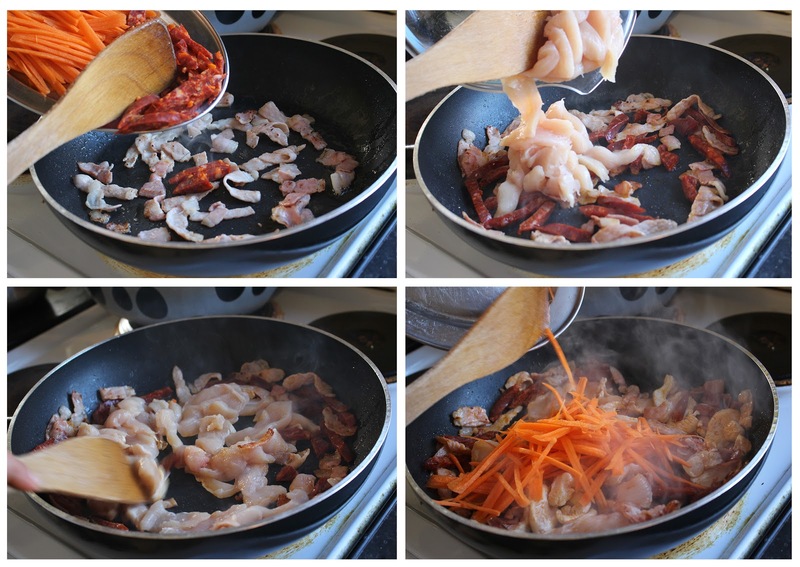 Add 1 table spoon cooking oil into a hot frying pan and cook the bacon for 3 minutes until slightly brown. Add in chorizo and toss well. Then add in chicken and mix well. Then add in shredded carrot. Add in also onion and mushrooms at the same time. Toss well and cook for 3 minutes. 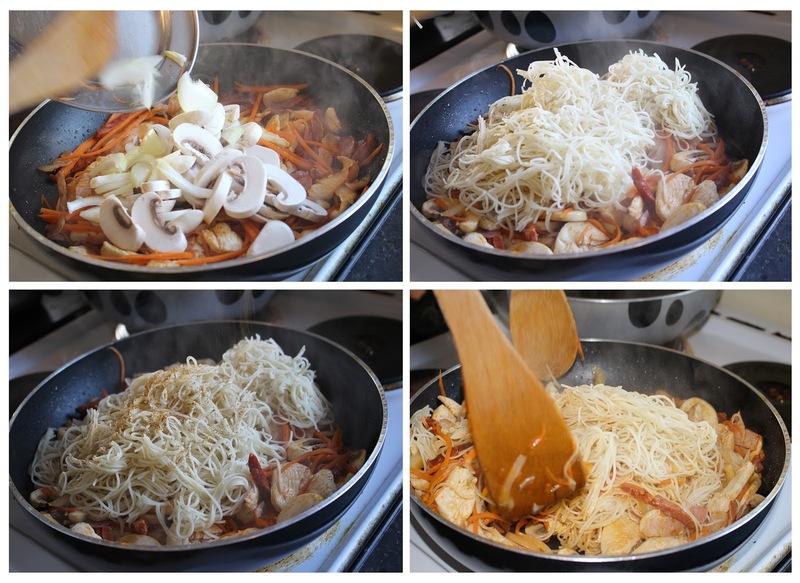 Use a scissor to cut the noodle short before adding to the pan. Sprinkle 1 table spoon of curry powder on top and mix well. I used two spatulas to mix. Then add in 2 table spoons soy sauce and mix all well together again. 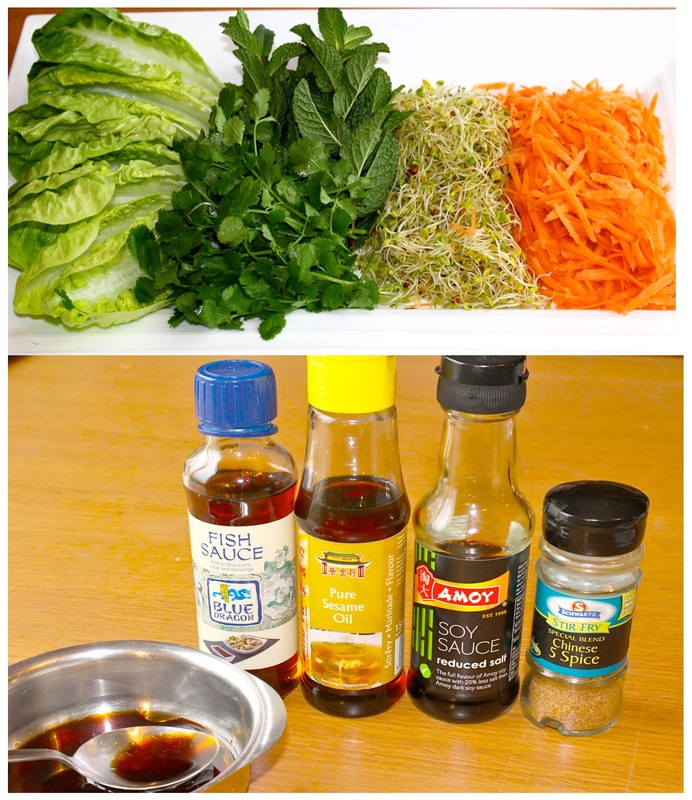 Add chopped bakchoi. Mix well. Add egg strings and mix well. 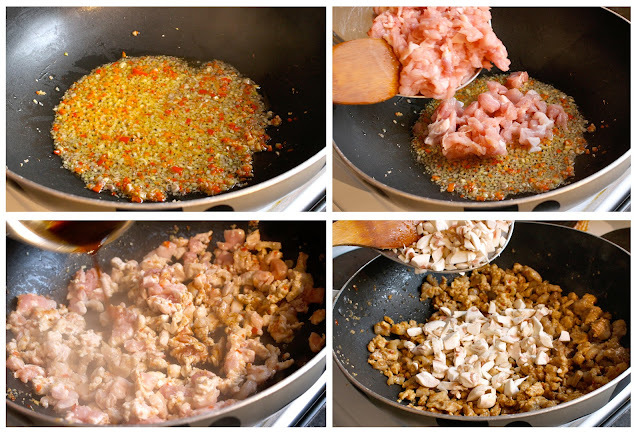 Cook for another minute and constantly mix everything together. When everything in the pan gets warm it's ready to serve. I'd never tried them before but seeing my friends sharing those beautiful spiral potato pics on Facebook while on holiday. 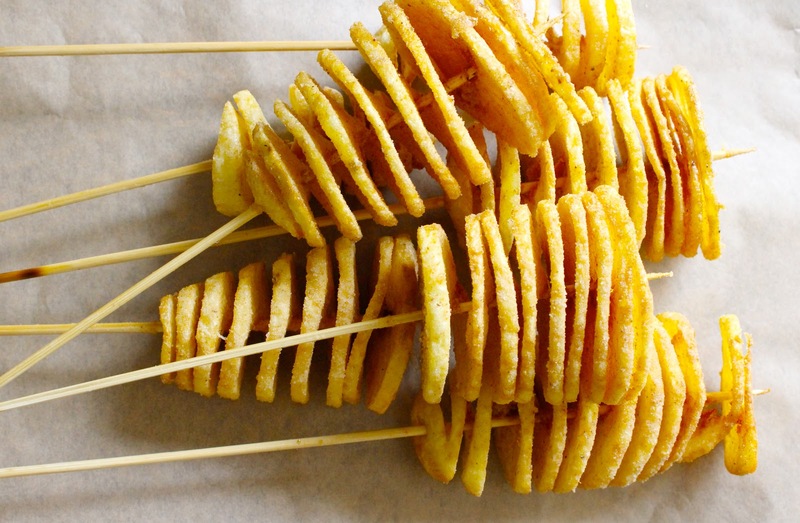 They are very popular snack, street food all over Asia. My first attempt making Asian spiral potato today, my kids finished them all in no time. 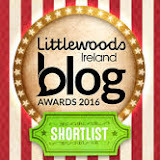 I am more than happy to do another batch for them and their Irish neighbour friends. It will require a bit of focus and patience. I had fun making it. Chose the long and flat potatoes. 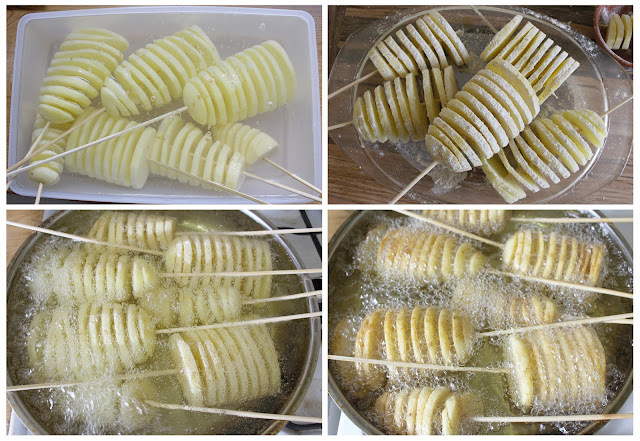 Soak the bamboo skewers in water while peeling the potatoes. 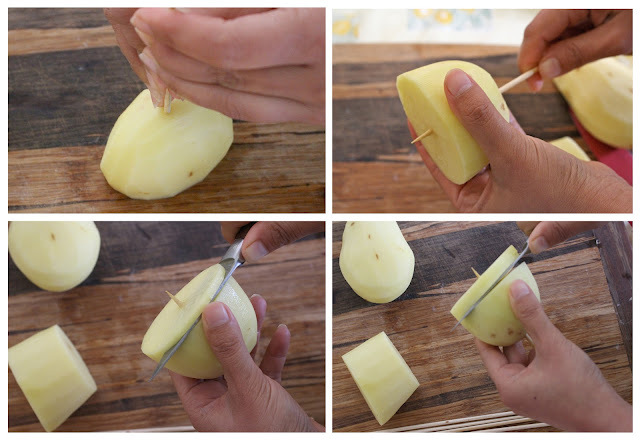 I am not that strong to push the skewer through the whole potato so I cut it into half. 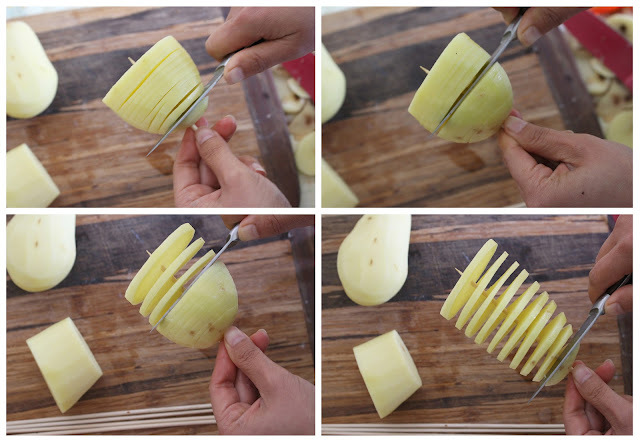 Use a sharp small knife and gently cut the potato, make sure you go slowly follow spiral core of the skewers to the end. 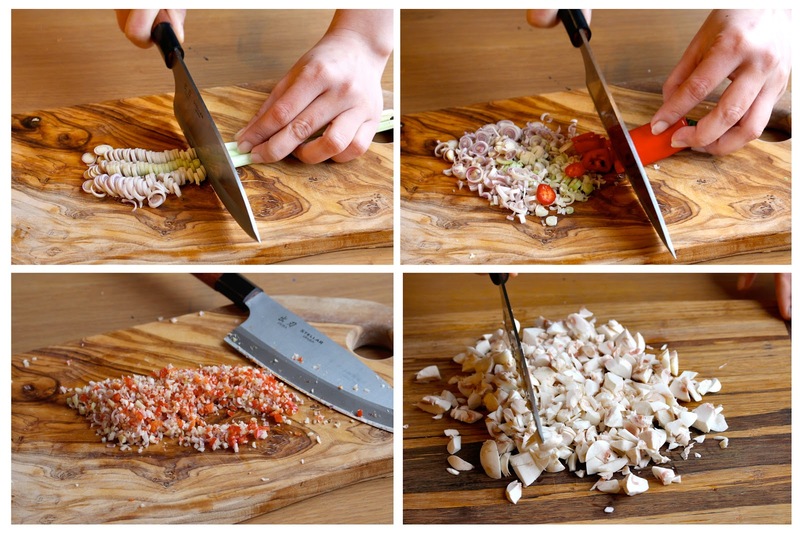 Once reaching to the end, press the knife and go backward to make sure the cut is through. From the top you push the cut down to make space using the knife. Soak them in water to remove the starch. Dust them with some flour ( mix in some curry powder and salt, black peppers or any kind of spice mixed you prefer)). In a large frying pan, heat up the oil and place the skewers neatly when the oil just slightly warm. Cook at medium heat. This way will help the flour stick to the potato. Turn occasionally until golden brown.